Earlier this week, New York City was sent into a deep freeze. After a very mild December, winter finally found us, if only for a short while. This arctic plunge brought the city its coldest air of the season to date. 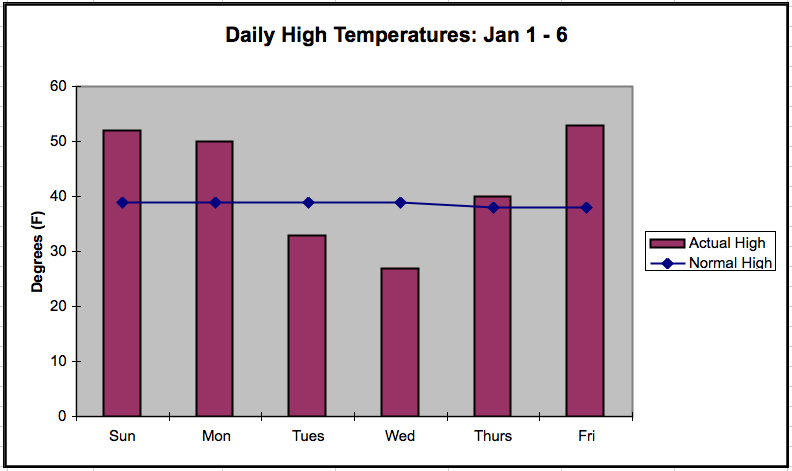 Temperatures remained below freezing for two consecutive days. Wednesday marked our coldest day since late January of last year with a low temperature of 13°F. This cold weather, however, did not last long. Warmer air returned by the end of the week and temperatures quickly rebounded to above average readings. This warm weather is very odd for January. Nonetheless, the local forecast is calling for a continuation of these spring-like conditions into next week. We will have to wait for the Jet Stream to dip south again for winter to return. This entry was posted in weather and tagged nyc, winter by Melissa Fleming. Bookmark the permalink.